Leon Rosselson has been writing songs and singing them for over 50 years. He has performed in every conceivable venue around the country, from pub rooms in Wigan and Warrington to the Albert Hall and Festival Hall in London, and has toured the United States, Canada, Holland, Belgium, Switzerland and Australia. He has written songs for community theatre and children’s street theatre, songs for a stage production of They Shoot Horses, Don’t They? and a scripted show about the nuclear threat called ‘No Cause for Alarm’. His song The World Turned Upside Down, about the 17th century Diggers, has become a protest anthem and was taken into the charts by Billy Bragg in 1985. He has recorded around 25 LPs and CDs and has published two songbooks. 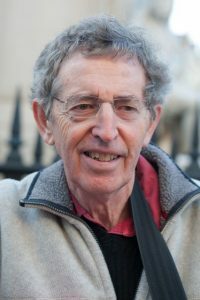 Leon has written many songs for children and has had 17 children’s books published, one of which, Rosa’s Singing Grandfather, published by Puffin, was shortlisted for the Carnegie Medal in 1991. A stage show based on his children’s story The Greatest Drummer in the World was premiered at the Drill Hall in London in 2002 and subsequently went on a nationwide tour of theatres and schools.